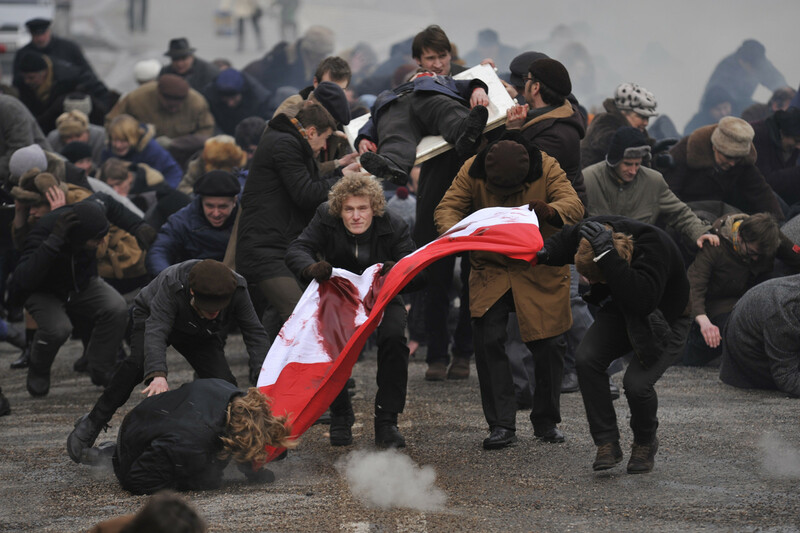 Black Thursday is a reconstruction of the tragic events that took place on Thursday 17 December 1970 in Gdynia. The film presents the true story of the family of a shipyard worker, Brunon Drywa, who was shot by the militia on his way to work. The film displays the street demonstrations of workers and the procession that was headed by the people who carried the body of the murdered Zbigniew Godlewski. The film illustrates the brutal pacification of the demonstrators made by the army divisions and militia that resulted in the death of 18 people and hundreds left injured. Born 1940, Warsaw, Poland. From 1958 to 1961, Krauze was an actor at the Student Theatre of Satire. In 1966 he graduated from the Directing Department of Lodz Advanced School of TV, Theatre and Cinema. To date, he has directed numerous documentaries and fiction films and also acting as a scriptwriter. The Painting (1969), A Place to Live (1971), Pajamas (1971), The God’s Finger (1972), The Fear (1975), Accursed Manor (1976), The Journey to Arabia (1979), The Candle Party (1980), The Station (1981), The Weather Forecast (1982), A Girl from the Excelsior Hotel (1988), Aquarium (1995), Black Thursday (2011).